This is another one of those "recipes" that is so simple, it seems silly to post it. I love it, though, and I want to share it with the blogosphere. I usually enjoy this chicken salad on a croissant, but since I've been on this focaccia kick, I started using focaccia, and I have to tell you, it takes chicken salad to a different level--spices it up a little bit. When I have chicken salad, I have to eat it with alfalfa sprouts too. If you don't have an aversion to this veggie, you really need to try it with chicken salad, on focaccia, a croissant, or whatever your favorite bread is. Do it. In a small bowl, mix the chicken and mayonnaise. Then stir in the almonds. Open up the focaccia and place chicken salad on the bottom half. 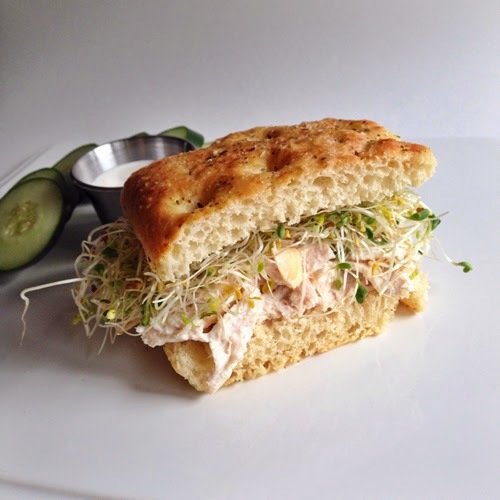 Place alfalfa sprouts on top of chicken salad. Top with the top of the focaccia. Enjoy.